"The Association for Library Service to Children (ALSC), a division of the American Library Association (ALA), has released three new Graphic Novel Reading Lists intended for children from kindergarten through 8th grade. PDF downloads of the book lists are available in color, and black and white. 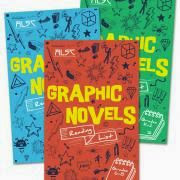 "ALSC's three Graphic Novels Reading Lists are full of engaging titles that are sure to excite children," said Ellen Riordan, ALSC president. Graphic novels on the list are defined as a full-length story told in paneled, sequential, graphic format. (The list does not include book-length collections of comic strips, wordless picture books or hybrid books that are a mixture of traditional text and comics/graphics.) The list includes classics as well as new titles that have been widely recommended and well-reviewed, and books that have popular appeal as well as critical acclaim.